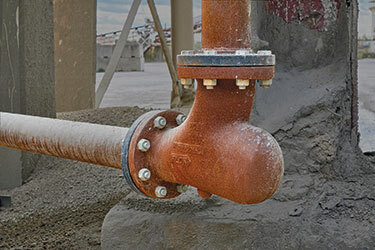 The Smart Elbow® deflection elbow installed in ready-mix plants prevents abrasive materials from impacting the elbow wall, eliminating worn elbows, related downtime and recurring maintenance costs. 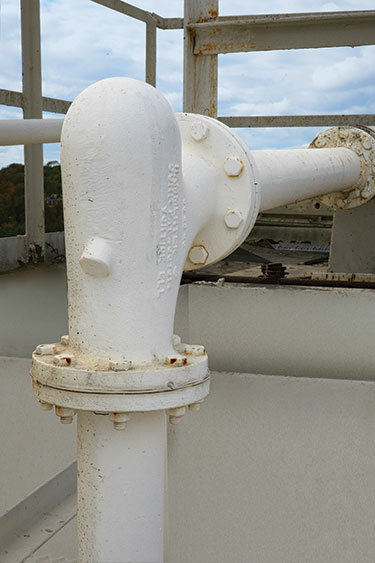 Action Supply, Sharon Hill, PA, eliminated surprise blowouts and associated repair costs after switching to short radius deflection elbows that minimize elbow wear. HammerTek short radius deflection elbows eliminated the need to weld or replace failed sweep elbows 100 ft in the air. The teardrop-shaped vortex chamber of the short radius elbow protrudes partially beyond the 90-degree flow path, causing a sphere of material-in-air to rotate in the same direction as the air stream, gently deflecting incoming material around the bend. 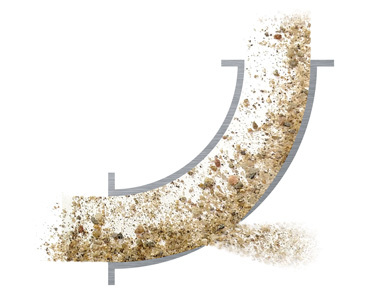 Conventional sweep elbows can blow out as a wear point develops from abrasive materials impacting the elbow wall. 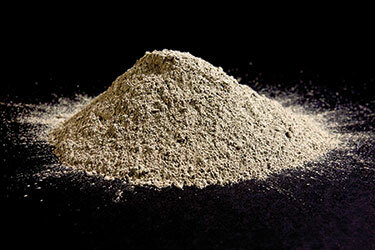 Abrasive cementitious material will wear out conventional sweep elbows, necessitating replacements, downtime and costs. SEVERNA PARK, MD — Concrete Plants, Inc. (CPI) has provided turnkey batch plant equipment, service and parts to ready-mix and precast concrete plants from Maine to South Carolina since 1974. 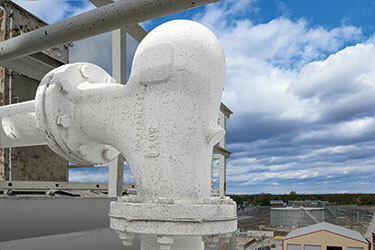 For many years, customers were resigned to abrasive materials wearing through the elbows of their pneumatic conveying system elbows until 2001, when CPI began specifying HammerTek deflection elbows, in which abrasive materials are prevented from impacting the elbow wall. According to Emil Garlewicz, vice president and sales representative for CPI's New Jersey, Pennsylvania and Delaware territories, "The improvements virtually eliminate worn elbows, related downtime and recurring elbow maintenance costs for CPI's customers." 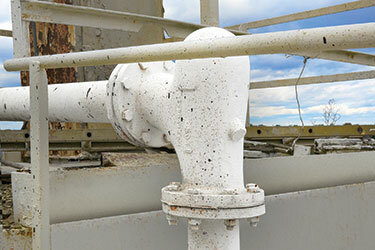 Garlewicz says ready-mix producers appreciate long elbow life because they are conveying Portland cement, fly ash, slag and other abrasive cementitious materials that wear conventional elbows rapidly. He notes that customers sometimes purchase their first single HammerTek elbow if making an emergency repair to a standard sweep elbow, "but later will add a half-dozen or more to retrofit an entire pneumatic conveying circuit once they see how well it works." Such was the case for Tom Tower, owner of Action Supply in Seaville, NJ, whose ready-mix plants provide concrete for general construction, bridge work and specialty concrete work. Tower says he originally welded patches on worn-through sweep elbows and on new replacement elbows before swapping out worn, leaking ones. "The best we would get from an original ell would be two, maybe three years if the elbow was reinforced with patches before we installed it," he says. "Either way, we were going to be shut down for at least a half-day to a day to make the replacement or repair." "The first Smart Elbow deflection elbow we installed in 2001 is still in operation today," he says, "and has increased plant longevity and decreased maintenance downtime." He has subsequently replaced five additional sweep elbows with deflection elbows at three plant locations to handle about 150 tons of cement powder per plant per day, as well as fine slag. Collectively, he says eliminating elbow repair and replacements at those plants has saved two weeks of downtime since the conversion. Another CPI customer, Ernie Forlini, owner of Action Supply ready-mix plants in Sharon Hill, PA, has eliminated surprise blowouts and resulting repair labor after switching to deflection elbows. 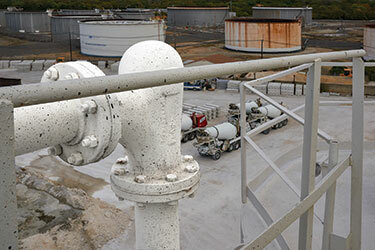 "We installed our initial HammerTek elbow in 2010 at the suggestion of CPI's Emil Garlewicz," he recalls. "Until then, elbow blowouts that spouted dust into the atmosphere were an ongoing problem that could pop up at any time. We'd weld a plate on the elbow, and the patch would blow out several months later." 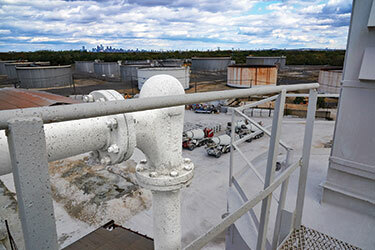 Downtime and the inconvenience of having to weld or replace a failed elbow from a crane 100 feet up compounded the problem, according to Forlini. "We are working with a perishable item," he says, "and time is money for our customers. By eliminating the surprise blowouts, we have been more consistent and timely in our deliveries." Based on his initial elbow installation, Forlini has retrofitted all of the conventional elbows at his three ready-mix plants. The deflection elbows are incorporated into pneumatic lines that transfer cement powder as well as fly ash or brown slag used as a pozzolan to reinforce the concrete. 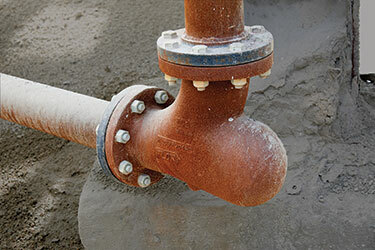 "We have had no change-outs with the short-radius elbows," he says, "and no more worries about holes in the pipes. I don't even have to look at the tops of the silos any more." Garlewicz says, "The HammerTek elbows are easier to retrofit, and standard schedule 80 elbows have a larger radius and are harder to handle, especially when 100 feet in the air on a crane." 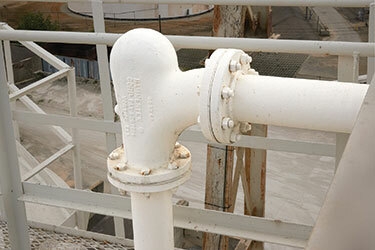 Despite the short radius design, material exits the deflection elbow uniformly across the diameter of the outflow, instead of skidding along the outermost wall of the elbow and downstream tubing/pipe. 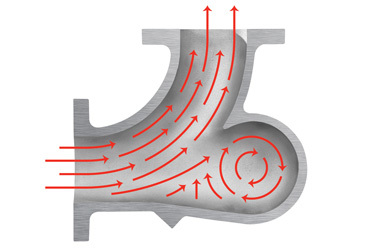 "Even though the vortex area in the elbow where the material rotates has a small radius, the design enhances efficient flow because it creates less head pressure in the pipe," he explains.